Here is a selection of sample chapters in PDF format that you are welcome to review and try. We all want good friends. How does one make good friends? Share your ideas about friendship with your partner. Everyone has to deal with change. Sometimes it's fun; sometimes it's hard. Crime – from burglary and bribery to car theft and murder – continues to hurt our society. 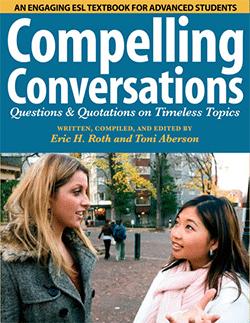 Discuss your experiences, share your ideas, and explore possible solutions with your classmates. How well do you know your own habits? Share something about your habits and find out more about your partner’s habits in a friendly exchange. Experts recommend that all job seekers, including native English speakers, practice their interviews. Photography surrounds us in the 21st century: on billboards, on the Internet, in magazines, and in our homes. 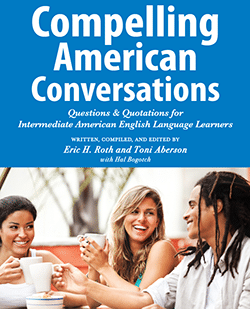 The Search and Share Exercises are stand-alone online activities that come from Compelling American Conversations. Everybody eats. Food is both a necessity and a pleasure. It is also a safe and interesting way to learn more about people. We have spent thousands of hours in schools, learned many skills, and collected numerous stories. Many people have their fondest memories from years in school. How do you flip an English classroom? One way is to deploy "Search and Share" worksheets for homework. These "Search and Share" activities require English students to find, summarize, and describe videos and articles for their classmates. 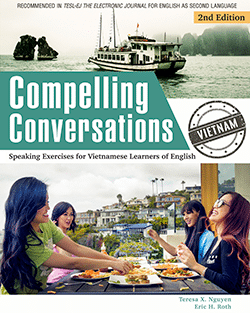 These 12 fluency-focused activities create lively conversations and memorable discussions. 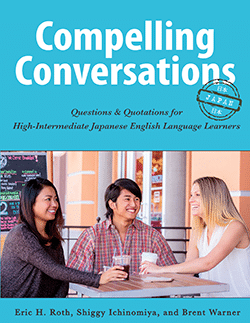 This collection of Search and Share come from Compelling Conversations - Japan. Everybody eats. Food is both a necessity and a pleasure, and remains a safe and interesting way to learn more about people.